For more information, see Ferrari. 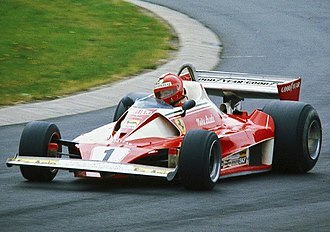 Wikimedia Commons has media related to Ferrari vehicles. Pages in category "Ferrari vehicles"
The Ferrari 348 is a mid-engined, rear-wheel-drive V8-powered 2-seat sports car by Ferrari, replacing the 328 in 1989 and continuing until 1995. It was the final V8 mid-engine model developed by Enzo Ferrari before his death, the 348, badged 348 tb for the coupé and 348 ts and the 348sp versions, features a normally aspirated 3. 4-litre version of the quad-cam, four-valve-per-cylinder V8 engine. As with its predecessors, the number was derived from this configuration. The engine, which produced 300 hp, was mounted longitudinally and coupled to a manual gearbox. The T in the model name 348 tb and ts refers to the position of the gearbox. Overall,2,895 examples of the 348 tb and 4,230 of the 348 ts were produced, the F355 that replaced it returned to the styling cues of the 328 with round tail lights and rounded side air scoops. Fifty-seven Challenge models were built for owners who wanted a more track-ready car, the 348 was fitted with dual-computer engine management using twin Bosch Motronic ECUs, double-redundant anti-lock brakes, and self-diagnosing air conditioning and heating systems. Late versions have Japanese-made starter motors and Nippondenso power generators to improve reliability, U. S. spec 348s have OBD-I engine management systems, though European variants do not come with the self-test push button installed, which is needed to activate this troubleshooting feature. This had the effect of making the doors very wide. The 348 was equipped with an oil system to prevent oil starvation at high speeds. The oil level can only be checked on the dipstick when the motor is running due to this setup. The 348 was fitted with adjustable suspension and a removable rear sub-frame to speed up the removal of the engine for maintenance. This vehicle served as a test mule for the Ferrari Enzo, between 1992 and 1993 Ferrari made 100 units of 348 Serie Speciale of its tb and ts versions. It was a limited edition made for the US market. During 1992 -1993 there were only 35 TB Serie Speciales manufactured with the remainder being the TS Serie Speciale, Ferrari indicates a 0-60 mph time of 5.3 seconds and a standing ¼ mile of 13.75 seconds. The Ferrari GTO is an exotic homologation of the Ferrari 308 GTB produced from 1984 through 1987, designated GT for Gran Turismo and O for Omologato. The Ferrari GTO was built to compete in the new Group B Race series, after the death of Henri Toivonen and his co-driver Sergio Cresto in the 1986 Tour de Corse, the FIA disestablished the class, leaving just the Group A Rally championship. As a result, the GTO never raced and all 272 cars built remained purely road cars, some of the GTOs styling features were first displayed on a 308 GTB design exercise by Pininfarina shown at the 1977 Geneva Salon. The 288 GTO started out as a version of the 308/328 to hold down costs and to build the car quickly. Easily noticeable differences were the GTOs bulging fender flares, larger front/rear spoilers, large flag-style outside mirrors, retained from the original 250 GTO were slanted air vents, put in the GTOs rear fenders to cool the brakes. The GTO had wider body panels than the 308s because they had to much larger Goodyear tires mounted on racing wheels. The suspensions height could be set higher for use and lower for racing on tracks. Bodywork material was new and lighter for better acceleration and handing, the GTOs weight was only 2,555 pounds, compared to 3, 085-3,350 for the 308/328. Steel was used just for the doors because major body panels were made from molded fiberglass, Kevlar was used for the hood, and the roof was made from Kevlar and carbon fiber. The GTO was based on the mid-engine, rear wheel drive 308 GTB, the 288 refers to the GTOs 2.8 litre V8 engine as it used a de-bored V8 with twin IHI turbochargers and Weber-Marelli fuel injection. The 2855 cc engine capacity was dictated by the FIAs requirement for a Turbocharged engines capacity to be multiplied by 1.4 and this gave the GTO a theoretical engine capacity of 3997 cc, just under the Group B limit of 4.0 litres. 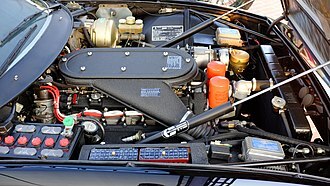 Unlike the 308s 2926 cc engine, the GTOs 2855 cc engine was mounted longitudinally and this was necessary to make room for the twin turbochargers and intercoolers. The Ferrari 612 Scaglietti is a 2+2 coupé grand tourer produced by Ferrari between 2004 and 2010. The 612 Scaglietti was designed to replace the smaller 456 M, the design, especially the large side scallops and the headlights, pays homage to the custom 1954 Ferrari 375 MM that director Roberto Rossellini had commissioned for his wife, Ingrid Bergman. The 612 is Ferraris second all-aluminium vehicle, the first being the 360 Modena and its space frame, developed with Alcoa, is made from extrusions and castings of the material, and the aluminium body is welded on. The chassis of the 612 forms the basis of the 599 GTB, the 612 Scaglietti shares its engine with the Ferrari 575 Superamerica. The engine has compression ratio of 11,1 and it has a top speed of 320 km/h and has a 0–100 km/h acceleration time of 4.2 seconds. The 612 comes with 6-speed manual or the 6-speed F1A semi-automatic paddle shift system, the 612 was produced at Ferraris Carrozzeria Scaglietti plant, the former home of the cars namesake coachbuilder in Modena, Italy. The Ferrari 599 is an Italian sports car produced by Ferrari. It was the brands flagship, replacing the 575M Maranello in 2006 as a 2007 model. Styled by Pininfarina under the direction of Ferraris Frank Stephenson, the 599 GTB debuted at the Geneva Motor Show in February 2006 and it is named for its total engine displacement, Gran Turismo Berlinetta nature, and the Fiorano Circuit test track used by Ferrari. The Tipo F140 C6.0 L V12 engine produces a maximum 620 PS and its 608 N·m of torque was a record for Ferraris GT cars. Most of the modifications to the engine were done to allow it to fit in the Fioranos engine bay, a traditional 6-speed manual transmission as well as Ferraris 6-speed called F1 SuperFast is offered. The Fiorano sees the debut of Ferraris new traction control system, the vast majority of the 599 GTBs have been equipped with the semi-automatic gearbox as opposed to the manual 6-speed gearbox. Only 30 examples have been produced with a manual gearbox of which 20 were destined to the United States and 10 remained in Europe. 0-100 km/h in 3.7 seconds 0-200 km/h in 11.0 seconds Top speed, the ride height has been lowered, which lowers the cars center of gravity. The package includes optimised tyres featuring a compound that offers improved grip, the cars electronics have changed. The gearboxs shifts are faster in high-performance settings, while new engine software improved accelerator response, the exhaust silencer was modified to produce more marked and thrilling sound under hard usage while still delivering just the right comfort levels at cruising speed. The exterior and interior were upgraded with more carbon fiber components, on 8 April 2010, Ferrari announced official details of the 599 GTO. Its engine produces 670 PS at 8250 rpm, with 620 N·m of torque at 6500 rpm, Ferrari claims the 599 GTO can reach 100 km/h in under 3.3 seconds and has a top speed of over 335 km/h. At 1,605 kilograms, the 599 GTO weighs almost 100 kg less than the standard GTB, production is limited to 599 cars. Of these, approximately 125 were produced for the United States market, Ferrari has given only two other models that used the GTO designation, the 1962250 GTO and the 1984288 GTO. The Ferrari 458 Italia is a mid-engined sports car produced by the Italian sports car manufacturer Ferrari. The 458 replaced the Ferrari F430, and was first officially unveiled at the 2009 Frankfurt Motor Show and it is replaced by the Ferrari 488, which was unveiled at the Geneva Motor Show 2015. The body computer system was developed by Magneti Marelli Automotive Lighting. The 458 is powered by a 4,499 cc V8 engine of the Ferrari/Maserati F136 engine family, the engine features direct fuel injection, which is a first for Ferrari mid-engine setups in its road cars. The only transmission available on the 458 is a dual-clutch 7-speed Getrag gearbox, there is no traditional manual option, making this the fourth road-car after the Enzo, Challenge Stradale and 430 Scuderia not to be offered with Ferraris classic gated manual. It is the first mainstream model to not be offered with a manual transmission, the brakes include a prefill function whereby the pistons in the calipers move the pads into contact with the discs on lift off to minimize delay in the brakes being applied. This combined with the ABS and standard Carbon Ceramic brakes have caused a reduction in stopping distance from 100–0 km/h to 32.5 metres. Tests have shown the car will stop from 100 km/h in 90 feet or in 85 feet with run flat tires,85 feet from 60 mph and 80 feet from 60 mph with run flat tires, the adaptive magnetorheological dampers are co-developed with BWI Group. Ferraris official 0–100 km/h acceleration is 2. 9–3.0 seconds, the top speed is 340 km/h. It has fuel consumption in combined cycle of 13.3 L/100 km while producing 307 g/km of CO2, in keeping with Ferrari tradition the body was designed by Pininfarina under the leadership of Donato Coco, the Ferrari design director. The interior design of the Ferrari 458 Italia was designed by Bertrand Rapatel, the cars exterior styling and features were designed for aerodynamic efficiency, producing a downforce of 140 kg at 200 kilometres per hour. In particular, the front grille features deformable winglets that lower at high speeds, according to British car magazine Autocar, the 458 Italias design has drawn inspiration from the Enzo Ferrari and its Millechili concept car. See the 166 Inter GT car The Ferrari 166 S was an evolution of Ferraris 125 S sports race car that became a sports car for the street in the form of the 166 Inter. Only 39 Ferrari 166 S were produced, soon followed by the production of the 166 Mille Miglia which was made in larger numbers from 1949 to 1952. 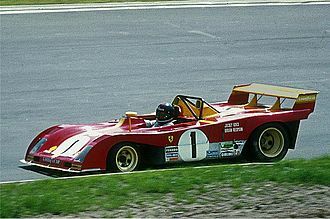 The 166 MM were in fact updated 166 S and were the cars to many of Ferrari’s early international victories. It shared its Aurelio Lampredi-designed tube frame and double wishbone/live axle suspension with the 125, like the 125, the wheelbase was 2420 mm long. 39 examples were produced from its introduction at the Turin Motor Show in 1948 to its retirement in 1950 and it was replaced by the 2.3 L195 S in 1950. 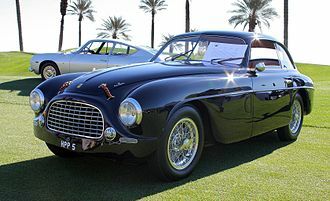 The first 166 Inter was designed by Tourings chief stylist, Carlo Anderloni,166 S competition models were generally coachbuilt by Carrozzeria Allemano. The 1.5 L Gioacchino Colombo-designed V12 engine of the 125 was changed, with overhead camshafts specified. This was achieved both a bore and stroke increase, to 60 by 58.8 mm respectively. The Ferrari 360 is a two-seater sports car built by Ferrari from 1999 to 2005. It succeeded the Ferrari F355 and was replaced by the Ferrari F430 and it is a mid-engined, rear wheel drive V8-powered coupe. Ferrari partnered with Alcoa to produce a new all aluminium space-frame chassis that was 40% stiffer than the F355 which had utilized steel. The design was 28% lighter despite a 10% increase in overall dimensions, along with a lightweight frame the new Pininfarina body styling deviated from traditions of the previous decades sharp angles and flip-up headlights. The new V8 engine, common to all versions, utilizes a 3.6 litre capacity, flat plane crankshaft, titanium connecting rods and generates 395 bhp. Despite what looks like on paper modest gains in reality the power to weight ratio was improved on over the F355. According to Ferrari weight was reduced by 60 kg and the 0 to 100 km/h acceleration performance improved from 4.7 to 4.5 seconds, the 360 Modena press car was ludicrously quick and sounded more like Schumachers weekend wheels than a street car. But the other cars were different, when Car and Driver tested a F360 it proved heavier and slower than its predecessor five years before. There were 8,800 Modenas and 7,565 Spiders produced worldwide, there were 4,199 built for the US market,1,810 Modenas and 2,389 Spiders. Of those numbers there were only 469 Modenas and 670 Spiders that were produced with a gated 6 speed manual transmission as opposed to the automated F1 single clutch transmission. In addition to there were the low volume factory race cars. The first up was the 360 Modena Challenge, used in a one make series, the N-GT was a 360 Challenge car evolved even further to compete more seriously in the FIA N-GT racing classes alongside other marques such as Porsche. A single 360 Barchetta was produced as a wedding present from Ferrari to former Ferrari president Luca di Montezemolo. The first model of the 360 to be shipped was the Modena, named after the town of Modena and its six-speed gearbox is available as a manual, or an F1 electrohydraulic manual. The instrument panel of the 250 GT Lusso had an unusual design for its time. 1965 275 GTB, Series I "short nose"
1987 Ferrari 288 GTO Evoluzione. 1987 328 GTS, with original concave wheel design. 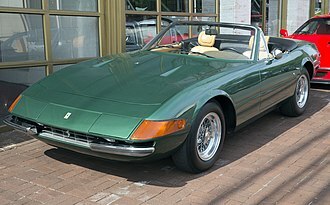 1989 328 GTB, equipped with ABS and convex wheel design.